Its about time for a finished quilt post, no? I bought fabric for this one way back in January, first posted about it in April, and finally now I can show the finished product! I had a tough time with this one, to be honest. Girly is not my thing, so pink and yellow was difficult for me to work with. 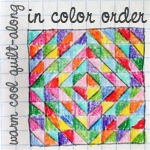 Much indecsion was put into this quilt, it was hard to decide on a pattern, then a quilting pattern, and in someways, my ambivalence shows. there is some bad piecing, puckering, and sloppy quilting..but I know that all these things are only visible to me, and the recipient will love it. My favorite part is the back...I have fallen totally in love with that yellow print, it is the perfect yellow shade - not too neon, lemony or school-bus, but a nice mellow butter yellow. 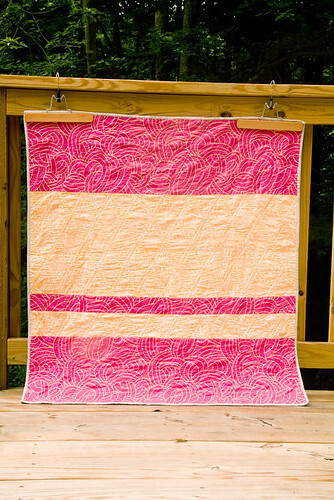 Its quilted with double straight lines, following the diamonds on the front, which creates a neat texture on the back. Off to the post office, the baby its for is due any day now! This is beautiful! 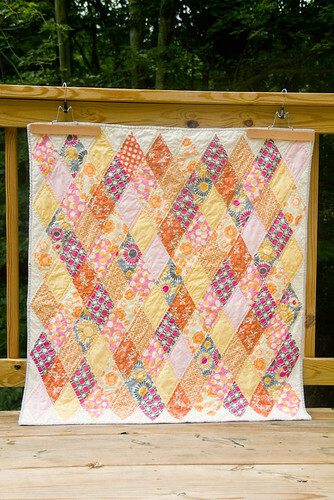 It works great as a girl quilt, but its not over the top girly! And I love the pattern too!